Once upon a time, super hero movies were not taken all that seriously. Come on, guys in silly costumes running around hitting each other? That was the domain of campy TV shows like Batman and Wonder Woman. Sure, the Christopher Reeve SUPERMAN had given the costumed crusader genre some respectability, but most of the other comic book fare of the seventies and eighties was cheap TV fare like the Bill Bixby/Lou Ferigno series The Incredible Hulk, or the even cheaper Spider-Man starring Nicholas Hammond in the title role (and not a single super villain to be found), or the two failed pilots for Captain America. But then Tim Burton came along with his BATMAN, and suddenly Hollywood started to take superheroes seriously. Supposedly James Cameron would be doing a Spider-Man film and Wesley Snipes would star as The Black Panther. And then there was The Fantastic Four, Marvel Comics first superheroes. Instead, we got Dolph Lundgren's disappointing big screen turn as THE PUNISHER, and yet another embarrassing take on CAPTAIN AMERICA courtesy of low budget filmmaker Albert Pyun. Meanwhile, a German producer named Bernd Eichinger had been sitting on the movie rights to Marvel Comics flagship characters, The Fantastic Four, since the mid eighties. Those rights were about to run out. So he approached "King of the B's" Roger Corman to co-produce a big screen version of the characters in 1992. On a budget of just over a million dollars. I realize that to some readers of The Cleveland Movie Blog, 1992 is ages ago. But I assure you, even in 1992 dollars, a million bucks was nowhere near enough to make a decent film about these iconic characters whose super powers included invisibility, turning into a being of living fire, stretching really far and into all kinds of shapes, and a super strong rock person. And yet, somehow, against the odds, director Oley Sassone, writer Steve Rabiner, and the rest of the cast and crew managed to make something for nothing. It wasn't good, but it was still better than it had any right to be. And it certainly deserved to be released. But it was not to be. DOOMED! 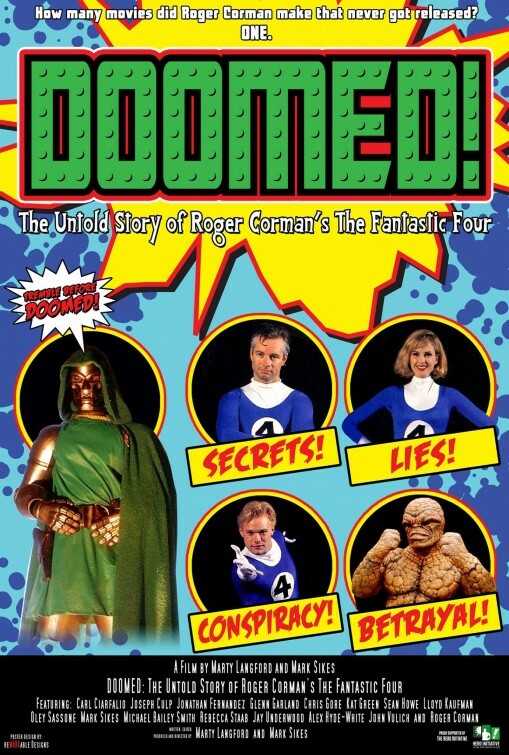 THE UNTOLD STORY OF ROGER CORMAN'S FANTASTIC FOUR is as comprehensive a look at the first attempt to make a live action Fantastic Four movie as anyone could hope for. The cast and filmmakers are interviewed about the experience, which despite how things turn out everyone still looks back on fondly. Even Roger Corman himself chimes in with memories of how and why it all went down, and eventually, went south. If nothing else, it's a fascinating look at just how stupid and ugly the business side of the movie business can be. And yet, at the same time, it's a surprisingly inspirational look at how, despite adversity, a group of people who genuinely cared about the movie they were making did their best, and came out with something watchable. Something that might have been even better with just a little more time and a little more money in post-production, and in fact still could be if someone ever decided to spend a few bucks to finish it properly. For those interested in the behind the scenes craziness of filmmaking, DOOMED! is essential viewing. It's fun, fast-paced, and informative. Plus there's ample footage from the never (legally) released film to make the comic book movie fanboys and girls happy. Sure, there are more important subjects to make a documentary about, but it's hard to imagine a better film about this particular subject than the one we have. Too bad the same still can't be said for any actual version of a FANTASTIC FOUR movie. Given what failures others have turned in with bigger budgets and bigger name casts, the version we see glimpses of here doesn't look so bad. 3 ½ out of 4 stars.